Who owns your friends: You or Facebook? Robert Scoble, the big time Web celeb and co-author of Naked Conversations, has been kicked off Facebook for violating the site’s terms of service. In a post about the move today, Scoble admits he was running scripts on the site (apparently in violation of Facebook’s terms of service) but says he should be allowed to take his friends with him and move to another social network. He’s thrown his support behind dataportability.org. Yes this is one of the reasons FB annoys me, it is MY social graph, my time and energy, I want to export it. Yes, it’s your time and energy, but is it really your social graph? Sorry Scoble, I disagree. As a private company, Facebook has no obligation to let you have a last meal and say your bye byes when you violate its terms of service. 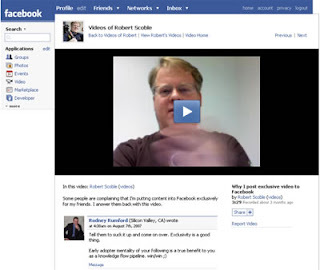 Scoble paints himself as some sort of dark knight vigilante, testing Facebook’s terms of service to protect us all. And maybe he is. But he broke the rules, he got caught and now he has to pay the price. Many will argue that it’s good business for Facebook to allow data portability. They say that the network that has the least onerous terms of service will prevail. And to a point I agree, but not when it comes to data portability. That’s kind of like saying that whatever restaurant lets people eat for free will get the most visitors. Social networks will make money on the strength of their members’ social graphs. Facebook gets this and won‘t let you take yours away without a fight. At Facebook Camp Toronto in October, Facebook’s Ami Vora boasted about the nework’s social graph and how it made Facebook so important and powerful for developers. Besides, it doesn’t look like Facebook has banned Scoble permanently, just “disabled” his account. It looks like he’s getting a chance to promise he won’t break the rules again. I think the chances of him agreeing to that are about as likely as the chances that Facebook will let him teleport his social graph to another network. (Thanks to Tyler Reed for this image of Scoble on Facebook). ← Previous Post Does the world need any more predictions? Is there anything I should be able to take out of social networking sites? Let’s look at the Yellow Pages. You’re saying I shouldn’t be able to photo copy the pages that my friends are on? OK, how about write down their names? So, with regard to Facebook, are we saying we’re not able to compare whether your name is on Twitter, or Facebook, or Yelp, or other social networks? That we’re not able to gather stuff like names, phone numbers, or email addresses for our other address books? Really? I can do that manually. Why not automate it? By the way, Facebook’s competitors DO let me copy my social graph stuff and put it INTO Facebook. Interesting that Facebook doesn’t like it both ways. Good points. But I think it comes down to where you draw the line. I think you and I would both agree that writing down friends’ e-mail contacts from Facebook would be okay. And I think we would both agree that using bots to scrape all our friends’ pictures off Facebook would be wrong. We just draw the line at a different place in the grey zone. Hello Keith…and Robert if you’re reading on. A very interesting and contentious issue. It interests me how fast Facebook took off and how concerns and questions about the service are now growing equally fast. I see both Keith and Robert’s point of view and I’m not really sure where I stand on this quite yet. One thought that comes to mind is to compare this issue to copyright. When you have an idea for something (e.g. a idea for a movie) that idea is not protected by copyright. What is protected by copyright is the expression of that idea (to follow the example, a written outline of a screenplay). Perhaps a piece of personal information, like an email address, can be passed freely back and forth through different networks (not protected) but how this information is organized and housed is protected. What gives Facebook its value is how it organizes information and then makes it easy to share with others. That’s the part that Facebook has a right to protect. That said, I think people have the right to own and share his or her personal information. If I have someone’s email address, I should be able to share that freely regardless of how I obtained it. After writing this far, I think I’m siding more with Scoble but I think Facebook has some kind of right to protect its business too. This story is getting increasingly interesting now that Facebook and Google have joined dataportability.org. I don’t have a problem with people being able to take away content that they have have contributed, but I do have concerns about other friends being able to export my private data and use it for however they wish. Let’s see how this evolves.